BOSTON, Mass. 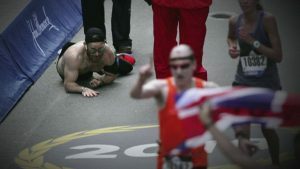 (NBC) – An unforgettable image came from Monday’s Boston Marathon: a man crawling across the finish line. His name is Micah Herndon, a 31-year-old U.S. Marine veteran, who ran to honor the lives of three men he knew while serving in Afghanistan. And simply put, there was no way, he wasn’t going to finish. Herndon, an Ohio native, competed as a tribute to the memories of three Marines he served alongside. Those three men didn’t survive an attack in Afghanistan in 2010. Their last names—Mark Juarez, Rupert Hamer, and Matthew Ballard—were attached to the laces of his running shoes. Along the route, the runner said the repetition of their names, again and again, serving as the fuel to keep him pushing through the pain. Finally, that pain became too much to bear. Herndon dropped to his hands and knees, painstakingly crossing the finish line after three hours and 38 minutes—a marine on a mission to honor his fellow fallen soldiers. Once Herndon crossed over the yellow and blue line, he was lifted into a wheelchair and given medical attention. He said the pain he felt during the marathon was nothing compared to the pain he felt losing those servicemen.